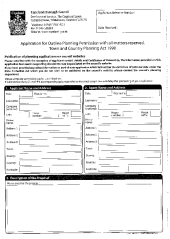 This form is generally used to find out, at an early stage, whether or not a proposal is likely to be approved by the planning authority, before any substantial costs are incurred. This type of planning application allows fewer details about the proposal to be submitted. These details may be agreed following a “reserved matters” application at a later stage. While some applications are straightforward and a decision can be made by the planning authority without detailed information, other proposals may need more information to be provided.